Built in 1856 to regulate the eastern border of the Grand Ronde Indian Reservation, Fort Yamhill represented a time of transition for the people of the Northwest. The fort served to ease tension between settlers and natives, protect both populations and control traffic between them. Fort Yamhill is one of the best archaeologically preserved forts in the Northwest from the mid 19th century. Times were hard for all. Native Americans from 27 tribes of Western Oregon were moved from their homes to the reservation - a confinement that imposed a new spoken language and white man's rules. Enlisted soldiers fought hunger, rain, isolation and monotony. Desertion was common, but the rough country usually drove deserters back to duty. 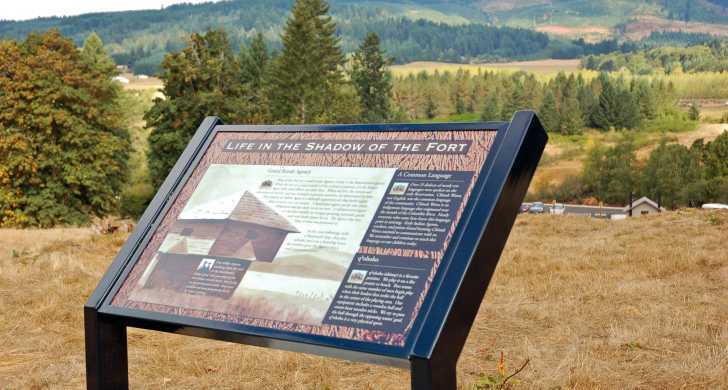 Visiting Fort Yamhill today offers an insight into the physical and emotional hardships endured by all the people involved, as well as the emotional tone of the state from 1856-1866. Exhibits and cultural restoration are provided in partnership with the Confederated Tribes of the Grand Ronde.